With virtual-reality poster-boy Oculus VR accepting a two billion-dollar buyout from Facebook, Microsoft having patented its own headset, Samsung rumoured to be working on a mobile iteration of its own, and Google handing out do-it-yourself cardboard headgear at I/O, we're entering the type of VR arms race not seen since the Lawnmower Man hit cinemas and the Virtuality arcades stole our lunch money. 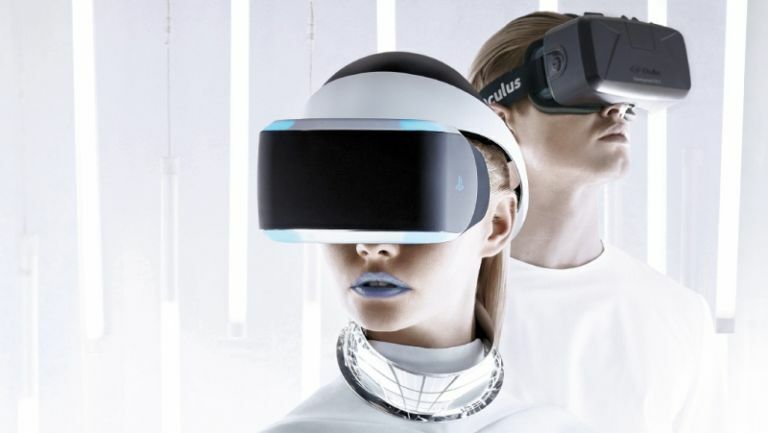 At the centre of this next-next-gen kerfuffle is Sony, whose Playstation-powered Project Morpheus prototype revealed at last year's Game Developers Conference, is looks like it could be first to go up against this summer's latest Oculus Rift upgrade. But which one stacks up best? For an in-depth look, check out our hands-on with Sony's Project Morpheus. Sony dipping its well-financed R&D toes into virtual reality was one of the worst kept secrets in tech – we mocked up a PS4 Rift last summer, in fact – but PlayStation waited until this spring to unveil Morpheus, part sensor-addled VR headset, part Daft Punk prop. Three years in the making, Morpheus is an intriguing slab of convergence tech, seeing Sony cherry-pick innovations from its many R&D divisions – HMZ cushioning, camera optics, 1080p displays, PlayStation Move motion sensors – to build a Frankenstein's monster of immersive entertainment. Co-developed by ex-NASA scientists and powered by PlayStation 4, it utilises the optional PS Camera and Move controllers as if it had been planned (it had), with a dearth of fully fledged demos suggesting it was never intended to be the focus so soon (it wasn't). Indeed, our hands-on time over a succession of months, which has involved everything from being lowered in a cage into shark-infested waters in The Deep to riding under trucks lying on a skateboard on Street Luge, could do wonders for aversion therapy. But the “anything” Sony outlined also includes everything from walking with dinosaurs to trying out hotel rooms before booking. The sleek, blue sensor-dotted headset is such a Jetsons-like vision of the future it's almost funny. Yet the adjustment settings remain very much 2014, which is where you see why this is still a prototype, a VR “spotter” needed to get the fit just right. It's essential, too, as like the similarly dual-imaged stereoscopic 3D, VR can become a bit of a blur if your alignment's awry. That said, it's light, a separate processing unit handling images and 3D audio duties through HDMI. Sound is also outsourced to your own headphones, either wired to the headset or wireless, if you prefer. The current 1080p LCD display running at 60Hz with a 90-degree field of vision is impressive, though not as wide or vibrant as Oculus's OLED, 110-degree offering. Better is the positional tracking, which breaks from the Rift by adding rear markers that enable you to move 360 degrees in virtual space without nausea; Oculus will no doubt be taking notes. With PS4 not a year old, Sony doesn't need new hardware to build games for, yet interest in wearables and VR as trends, not to mention Oculus's new cash injection, may be forcing its hand. The Deep was re-engineered to feel less like a theme park ride and more like a game for this year's E3. The shape of VR to come? For more specs and an in-depth review, take a look at our hands-on with the Oculus Rift DK2. It seems fitting that the little crowd-funded headset that could – and by “could” we mean revive the entire world's interest in virtual reality – has hit the monetary mother lode. Oculus VR's $2bn sellout to Facebook was frowned upon by those clinging to the quaint idea that Kickstarter is an investment website, not just a glorified pre-order service, but for the wider world it confirmed what some already knew: tying a screen to your face is, indeed, the future. The Zuckerberg handshake was clearly in the offing when we first demoed the new Oculus Rift DK2 developer kit, a spit and polished take on the firm's previous “Crystal Cove” headset, just days before the deal was finalised. Gone were the Eve Valkyrie and Doom 3 core thrills of last year's E3; in their place, a “VR's for everyone” masterclass. Couch Knights recreates a fully scaleable living room for multiplayer exploration, Elemental Tower Defence sets a blueprint for how to create a fully immersive board game, and Tuscany HD's update on the YouTube virtual-tourism fave saves money on a plane ticket. The positional tracking camera, much like Sony's, adds greatly to the sense of place, Crystal Cove's motion-capture track-ball dots now hidden in a more polished headset. And the 1920x1080 OLED display of the new Rift delivers clearer images than Sony, with noticeably less motion blur, although Morpheus is more comfy. Having used the incoming Facebook lolly to snap up key names from the likes of Google Glass, Nvidia, Doom creator id Software and Uncharted developer Naughty Dog, Oculus is no longer the nerdy guy tooling around in the garage, but a 125-strong team. There have been more than 30,000 pre-orders for its DK2 developer kit to date. In the build up to E3 2014, Oculus announced a new publishing division, building a roster of exclusives – including the Mario-like platform fun of Lucky's Tale from Words With Friends creator Paul Bettner and Polish bullet-time simulator Super Hot – that were all playable. The countdown to a retail release really can't have long to run. With a consumer Rift release originally proposed for the end of the year but not yet slated, it's anyone's guess what the Zuckerberg handshake, a ZeniMax court appeal, not to mention the looming spectre of a rival, does to Oculus's timeline. But if you know your way round a PC, and want VR now, Rift has the upper hand: you can buy a dev kit today.